In an effort to clean out the freezer, I made this rack of lamb last night. Organizing and cleaning has been my thing lately. Maybe its the summer break, but I am also equating it to nesting (25 weeks today). Jeff loves lamb and we bought a bunch from a local farmer - one of the perks of living near farms. I forgot that we had this beautiful piece of meat in the freezer until I cleaned it out. 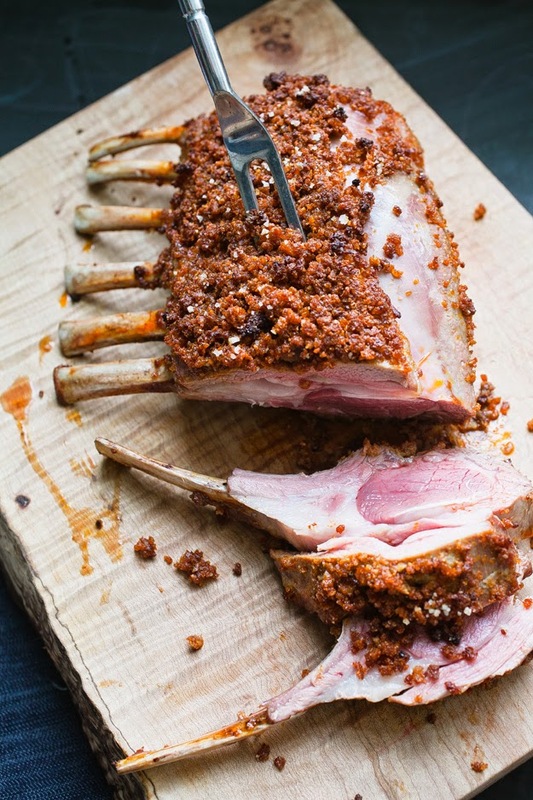 The name of the recipe truly explains it all, The Laziest, Most Delicious Rack of Lamb. It really is super delicious and very easy / "lazy" to prepare. Jeff was not a big fan of the paprika / pimentón as much as I was so next time I will substitute it with fresh rosemary. Seriously...what goes better with lamb than rosemary? I served roasted rosemary potatoes along side with a nice red wine, so I heard. - Use a good meat thermometer. Jeff received the Thermapen instant read thermometer for Christmas last year and it rocks. Its a bit pricey, but totally worth it. What else received 700 5 star reviews on amazon? - After cutting the potatoes for roasting, put them in the microwave for about 8-10 minutes. It will partially cook them and lessen the roasting time in the oven. I needed to share this recipe as it was that good, but it was gobbled up before taking any pictures. It did look just like the pictures right from the source.